Fire heavily damages KCK restaurant – Welcome to Wyandotte Daily! The Kansas City, Kansas, Fire Department is investigating a fire overnight at Captain D’s restaurant, 7525 State Ave., Kansas City, Kansas, that caused more than $500,000 damage. The cause of the fire is undetermined at this time. 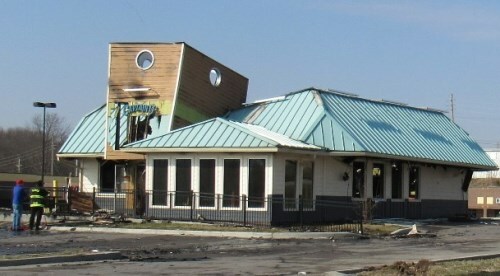 A fire at Captain D’s restaurant, 7525 State Ave., caused more than $500,000 damage overnight. The cause of the fire, reported at 12:34 a.m. March 26, is undetermined and is under investigation, according to a spokesman for the Kansas City, Kansas, Fire Department. Crews arriving at the fire reported heavy smoke and flames showing from the side of the one-story restaurant. Initially, crews fought the fire with an interior attack, the spokesman stated. Eventually all crews went into a defensive mode, and the fire was fought with elevated streams. The estimated dollar loss was $336,000 to the property and $200,000 to the contents, the spokesman stated. There were no injuries in this fire, according to the spokesman.